Vote for HPA! at OKRA Charity Saloon ALL of February! - Houston Pets Alive! Vote for HPA! at OKRA Charity Saloon ALL of February! Help HPA! win a LOT of money to help save more lives! For the entire month of February, HPA! is one of four charities competing for votes at OKRA Charity Saloon. If we win, we’ll receive OKRA’s proceeds in March! We need YOUR help to win! Come down to OKRA and VOTE for HPA! Invite all your Houston-based friends and family and bring everyone you know! We want HPA! represented at OKRA EVERY DAY this month! Share and spread the word! 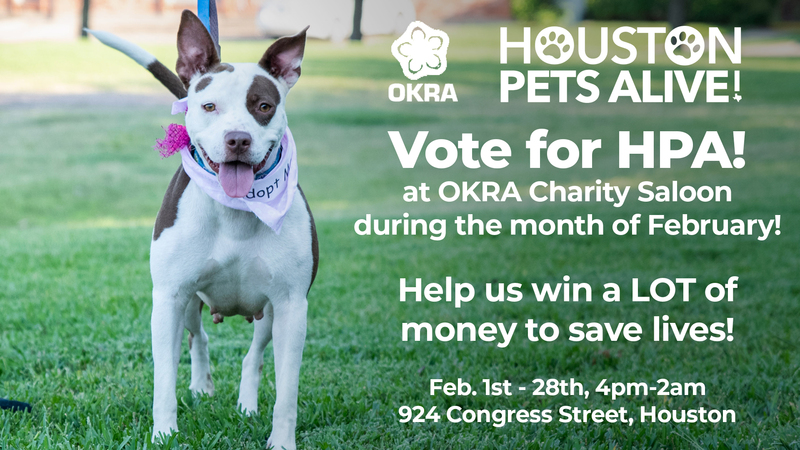 Remember, you can vote all month long, so come down to OKRA and vote for HPA! not once, not twice, but as many times as you can during February! Tag your photos on social media with #houstonpetsalive and #drinksfordogsandcats! Join us for special events at Okra on Feb. 14 & 26! Click here for details.